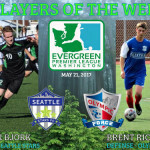 BELLINGHAM, WA— The Evergreen Premier League (EPLWA) today announces its latest Players of the Week on the heals of a weekend of action that saw 30 goals scored over 5 matches. In a weekend where 30 goals were scored there were a number of two-goal performances (“braces.”) The one that stood out most because it was crucial in his club’s victory was the pair scored by all-time EPLWA leading scorer Tyler Bjork. He helped his Seattle Stars to the top of the table with a wild 6-3 win at Yakima United. The score initially credited Bjork with a hat trick. However, Tyler was quick to point out that one of his goals actually belonged to Atty Taylor. Bjork’s teammate Miles Sanchez also scored twice in the match. The recognition marks the third straight year that the fast-starting Bjork has won POTW honors in the month of May. Sometimes it takes being in the right place at the right time — and ON time! Brent Riciglianois generally an attacking option for the Olympic Force. On Sunday against WPSS Shock he was inserted as an outside back when one his teammates was late to warm-ups. Brent went on to shut down the Shock as Olympic recorded their first-ever win over their bridge rivals by a score of 3-1. The top six teams in the final standings will make the first-ever playoffs for the Northwest Premier League in 2017. 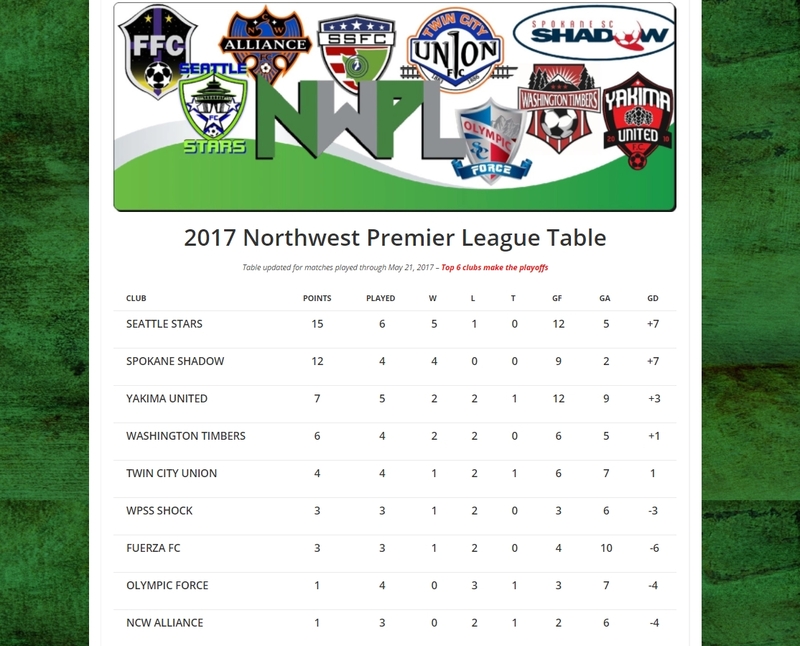 Right now Seattle Stars and Spokane Shadow are well on their way to making those playoffs as the two sides continue to win matches. The weekend of May 20-21 the Shadow won two more while Seattle bounced back from their only loss to win their 5th of the season. YAKIMA, WA— The Hoppers (2-2-1) slowed down the Stars (5-1-0) at Sozo by giving them their first loss of the 2017 season. Alexis Kreiger gave Seattle a 1-0 lead in the 44th minute. The Hoppers rallied in the second half on goals from Courtney Ahn in the 52nd and Madison Brownell in the 79th. Yakima goalkeeper Addy Eckstrom saved a Seattle penalty kick try in the 50th minute that would have made it 2-0. Instead the home side rallied for the big win. 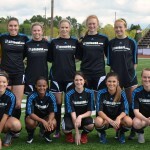 VANCOUVER, WA— The Spokane Shadow (4-0-0) beat the Washington Timbers 2-0 on Saturday at Harmony Sports Complex in the first-ever meeting between the two clubs at the NWPL level. Havana Johnson’sbrace was enough for Spokane. Her goals came in the 2nd and 27th minutes. 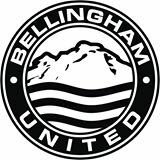 CENTRALIA, WA— The Spokane Shadow (4-0-0) continued their unbeaten road record in 2017 (and overall record as well) with a tight 2-1 win over the Twin City Union (1-2-1) on Sunday at Tiger Stadium. Megan Bare gave Spokane the lead in the 24th minute. The home side were level at halftime thanks to a goal in the 35th minute from Lauren Allison. Spokane’s winner came in the 69th from Tiana Helm. GIG HARBOR, WA— Washington Premier South Sound (1-2-0) earned their first win of the 2017 season with a 3-1 victory over the Olympic Force (0-3-1) at Peninsula High School in Gig Harbor on Sunday May 21. The Shock took a 1-0 halftime lead on a goal from Anna Gentile in the 16th minute. In the 48th minute Gentile scored her second of the match to make it 2-0. The Shock gave themselves some room to breathe when Dani Orellana made it 3-0 just three minutes later in the 51st. The Force ended the shut out with a goal of their own from Kaysie Bruce in the 61st. KENT, WA— A day after dropping their first match of the season the Seattle Stars (5-1-0) bounced back with a win over Fuerza FC (1-2-0) at French Field. Annie Flora gave the Stars the lead in the 30th minute. Fuerza drew level in the 46th thanks to Hannah Nicholson. Seattle’s winner came from Alexis Krieger in the 70th minute. 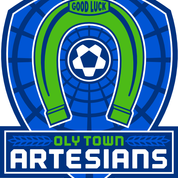 KENT, WA— Two of the players to watch this season on the Seattle Stars (1-0-0, 3 points) attack were in good form on opening day as the home side held for a 2-1 win over the Olympic Force (0-1-0, 0 points) at French Field. Tyler Bjork, the leading scorer in the history of the Evergreen Premier League, got his 35th career strike in the EPLWA in the 32nd minute (see video) to give Seattle a 1-0 lead. Brandon Gonzalez, recently featured in this goalWA.net story, made it 2-0 for Seattle with a goal of his own in the 51st. 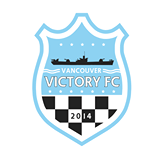 The Force kept battling and they were rewarded with a penalty kick call in the 89th minute. Diego Aceves converted the chance for a 2-1 final. The result reverses last year’s season opener for both sides which went to the Force, 4-1. 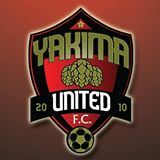 Next Saturday May 6 Seattle Stars will host Yakima United at French Field at 6 PM. 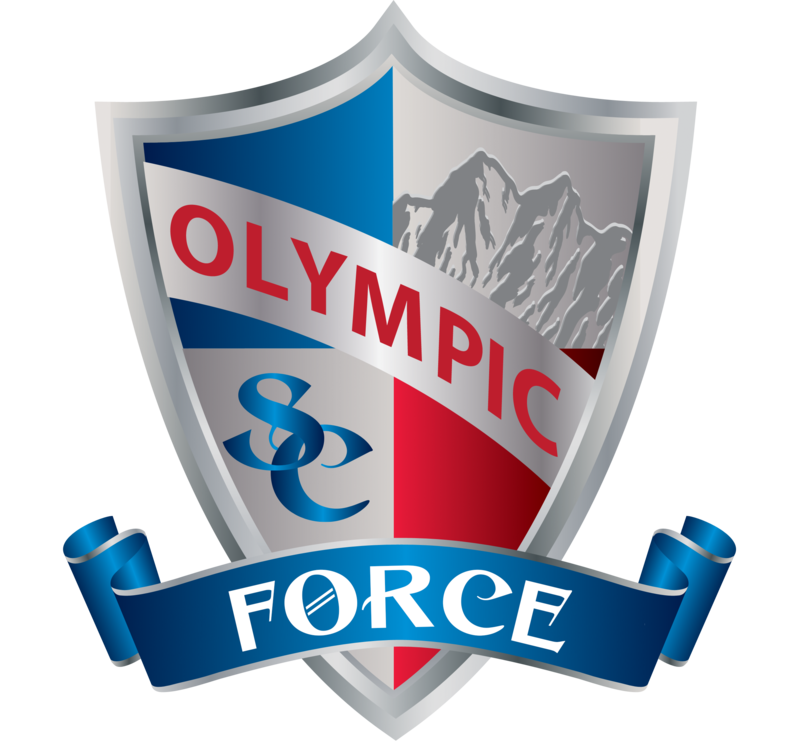 The next day the Olympic Force will be at Yakima to face the Hoppers at 4:30 PM at Sozo.